Courtesy of 54-year-old Anthony McCarley after completing a 13 hour Catalina Channel crossing and achieving the Triple Crown of Open Water Swimming with a within one year. 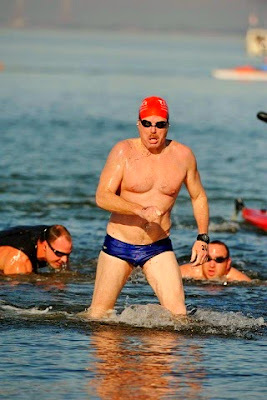 The [Catalina Channel] swim yesterday was mentally and emotionally the hardest I have done. The English Channel was physically harder, but on the English Channel swim once I knew I missed the point, I knew added hours to the swim. So it was just one punch. For the last five hours yesterday, I had to swim into a current that kept increasing in strength. I was doing feeds every 20 minutes and my crew kept me updated on the distance remaining and the rate at which I was traveling. So, of course I did the math - applying the new rate against the distance remaining - each time on how much time was left. While I was making progress against the distance, the time wasn't getting shorter and many times it got longer. So on each 20-minute update, I had to readjust my expectations. At one point I went from thinking I had about an hour and a half left to having almost 3. I was stuck at 1 hour 40 minutes remaining for four feeds. It was brutal. I didn't have a break until I came up to a feed and instead of getting the "One mile left" that I expected, I got "three quarters of a mile" from my team and Dan Simonelli who was in the kayak and told me I was out of the current. That was the happiest moment of the day.